June Lake, California is abundant in activities for the outdoor enthusiasts during all four seasons of the year. The landscapes here are beautiful and picturesque, with wildflowers in the Spring, fall colors, and beautiful snow covered mountain backdrops in the Winter. It’s the perfect area in the Sierra Nevada for your hikes, bike rides, rock climbing, fishing, skiing, riding snowmobiles, and so much more. There’s something here for everyone to enjoy. Springtime is one of the best of June Lake's four dynamic seasons to visit the area. There is still enough snow on the mountain to enjoy a blissful morning of skiing or riding to wake up your mind and body for a few hours. Once you’re warmed up you, you can go on a hike in the surrounding areas where the snow has started to melt. Later in the spring, there are several hikes where vibrant colored wildflowers have begun to bloom. One of our best kept secrets is the beautiful trip to Thousand Island Lake. For those who enjoy just sitting back and relaxing in the sun and catching some fish while the rest of the family is playing in the mountains, you’re in luck! The official fishing opener is the last week in April which is the beginning of the fishing season. June Lake Accommodations offers many great rentals for the eager fisherman. During the summertime, June Lake is the ultimate outdoor and sight-seeing playground. Enjoy some of our favorite hiking trails in the area, or just a short 30-minute drive north of June Lake you'll find Yosemite National Park, one of the world’s first and most famous national parks. Visitors from all over the world travel to the Sierra to experience the incredible natural wonders. There are hundreds of hikes in the Eastern Sierra, all with breathtaking scenery and views. Just 20 minutes south of June Lake is Mammoth Lakes. 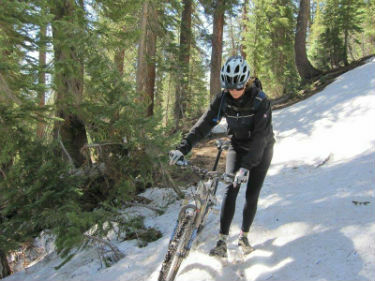 Here you can rent mountain bikes to ride around the bike paths in town, or be daring and ride the Mammoth Mountain Bike Park. Visit Devils Postpile National Monument and enjoy a few short, but satisfying hikes. 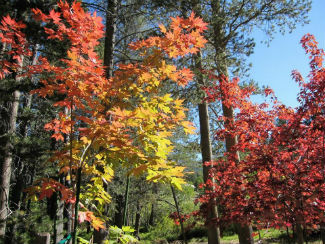 You can also head up to the Lakes Basin for a leisurely stroll or horseback ride. For the athletic and competitive types, there is the June Lake Triathlon held in early July. This triathlon is known as “The toughest race in the most beautiful place.” It is never too early to start planning your summer vacation! Fall in June Lake is all about "leaf peeping" the fall color and catching big fish! With an abundance of deciduous aspen trees in and around June Lake, the Eastern Sierra is one of the most sought out areas in the west for the vibrant gold, yellow, and red colors the leaves turn. Take a drive through the June Lake Loop where the roads are lined with colorful aspens or adventure into the wilderness on a hike to one of the lakes. The days are warm and nights are cool. After a long day of fishing or hiking, check out one of several natural hot springs in the areas surrounding June Lake. Winter is time for playing in the snow! Enjoy a quiet, peaceful day on the uncrowded slopes of June Mountain Ski Area, or drive just 20 minutes south to Mammoth Mountain for more terrain and steeper slopes. Drop into the backcountry for some fresh tracks on untouched powder. Take in the beauty of the mountains on a cross-country ski trail, snowshoe, or take the kids sledding for the day. One of the most scenic locations in the June Lake Ski Area is Rainbow Ridge. June Lake is your portal to backcountry adventures. Many approaches begin right from where you park. Or, better yet, begin your backcountry adventure right from the porch of one of our rental cabins! You’re going to love staying in one of the “Four Seasons” cabins. 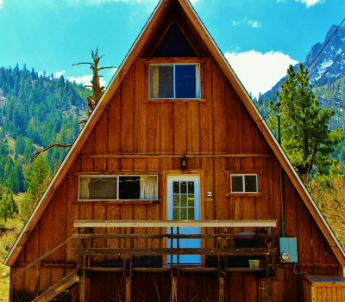 The Inyo National Forest is right off the back porch of each cabin. 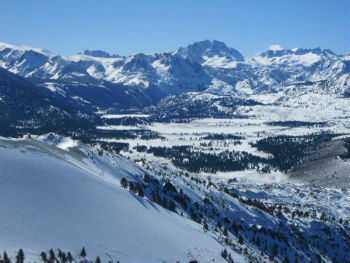 Views of the High Sierra and the John Muir Wilderness abound. The night sky is intensely bright and full of stars, especially on no moon nights. Our small town offers plenty of "hometown" accommodations including vacation homes and vacation condos. 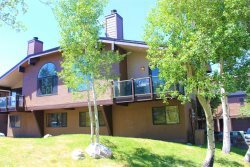 All vacation rentals are very clean and well maintained, affordable, and all are close to Gull Lake and June Lake. We also have pet-friendly vacation rentals. Are you looking for a romantic weekend or an extended stay with family and friends? 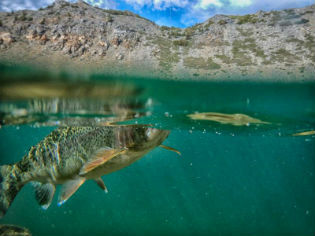 Hoping to catch a "lunker" trout, go skiing at June Mountain, test your skills on the hiking trails, or bike the June Lake loop? Whatever your vacation desires may be, let us help you book a June Lake Accommodation that will keep you coming back years from now. Book online today or call our friendly and local team here in June Lake at (760) 648-1919. We are happy to help you plan your vacation!